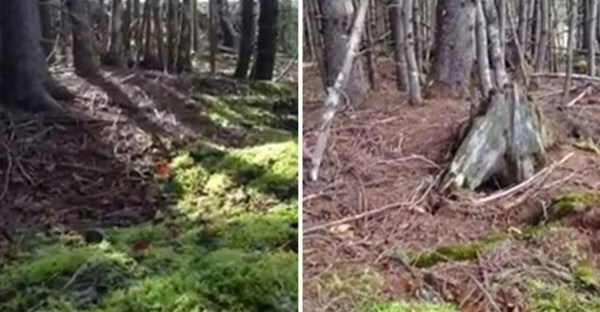 The eerie footage above was shot by Brian Nuttall in Apple River, Nova Scotia. “The wind was blowing the trees on the hill a few days after the [remnants] of Hurricane Patricia, it was a strong west wind. I walked across a choppins [sic] that was logged a few years back. As I entered a patch of trees spared from clear cutting, I noticed the ground moving. I believe the larger trees are doomed to blow down, but are currently spared, the smaller trees around them to help hold each other up, as the wind pushes the trees into one another. “I feel the trees didn’t grow deep, strong roots as they wouldn’t be needed when surrounded by a forest, sheltered with strength in numbers unlike a tree found alone in a pasture. The punishing prevailing winds have taken their toll on the side hill, the roots have loosened and the mossy ground from the once shaded forest floor are giving way, soon to be toppled over.